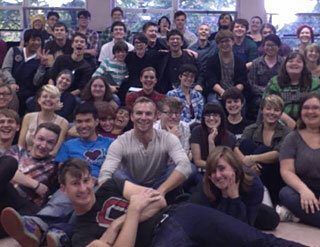 GALA Choruses leads the North American LGBT choral movement. Our more than 190 member choruses and their 10,000 singers look to us for support and leadership. We are dedicated to helping choruses become more effective, both artistically and administratively. We assist emerging choruses and facilitate networking and training for established groups. Currently, GALA Choruses is putting special focus on the implementation of programming that will assess and improve the sustainability of our member choruses. GALA Choruses’ signature event is our quadrennial Festival, which brings together over 130 choruses and 6000 singers for the world’s largest LGBT performing arts event. We are CATALYSTS. We provide enthusiasm, resources and tools to inspire our member choruses to use the power of music to create social change. We are HARMONIZERS. We are diverse people who employ the power of song with respect and understanding. We bring our communities together to experience musical excellence, collaboration, cooperation, acceptance, transparency, and opportunities for all. We are LISTENERS. We listen to our members, our colleagues, and each other in order to understand the issues, define our roles, and serve the common welfare of our movement. We are LEADERS. We offer strategic direction to the movement we serve. We work effectively with partners around the world who seek to achieve complimentary goals. We strengthen our association by nurturing effective leadership and ensuring robust, sustainable financial resources. A world where all voices are free. Empowering LGBT Choruses as we change our world through song. GALA Choruses strives for gender neutrality with regards to language in recognition of the many genders represented within our choruses, singing sections and the LGBT community. When communicating within the GALA community please keep these guidelines in mind. There are gender inclusive ways that you can address our community when speaking in a workshop or session. People or folks or simply everyone are more gender-neutral options (as opposed to Ladies and Gentlemen). Please refer to sections by voice part rather than gender, ie; tenors and basses rather than men or women. We know that gender specific language is a part of our culture and we don’t expect each individual to overcome years of conditioning overnight. We appreciate your attempt to communicate in the most gender-neutral way possible. The GALA family includes several Youth Choruses who are doing amazing things in their communities. We welcome delegates of all ages at GALA events, within the parameters of our Youth Policy. Each month we feature one of our talented member choruses in our membership spotlight section. Contact us today to find out how your group could be in the spotlight.